Well bred Shiloh Shepherd is a strikingly magnificent animal. These large dogs convey the nobility of their spirit and beauty of their soul. Shilohs should be well balanced, without undue extremes or coarseness, with effortless gait, and harmonious. The breed standard specifies that males should be at least 28” at shoulder and 110lbs when fully mature at around 3 years. Females should reach a minimum height of 26” and weigh 80lbs at maturity. There are two coat varieties – plush and smooth. The plush coated dogs have a close fitting outer coat of long hair with a softer, dense undercoat. Hair around neck and chest is longer and forms a distinct mane that is especially prominent in males. Both front and hind legs have fringes of longer hair as well. Plush coated dogs tend to have beautiful saber-like tails. It is surprising but this type of coat sheds less than smooth coats. Smooth coated dogs have a close fitting double coat with medium long, straight outer coat. This type of coat is very similar to the typical GSD coat. Hair around neck, chest, front legs and hind legs can be slightly longer than the rest of the body. Smooth coats shed year long and generally more than plush dogs. 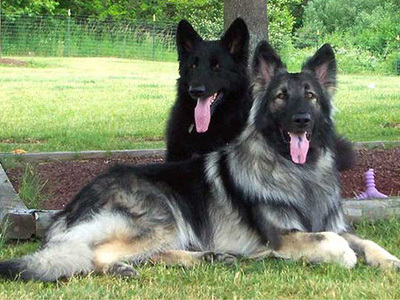 COLOR : The Shiloh Shepherd may be solid black, solid white, dual or sable in coloring. Dual describes a dog whose black hair is of a single color, black all the way to the roots. Sable (also called agouti) means that the black hair is two toned, the tips are black and the root portion is another color. The base color can be tan, brown, silver, cream, red and gray. The nose, eye rims and lips should be solid black as well the muzzle. The expressive eyes of the Shiloh Shepherd range from a dark to a light brown to yellow in color and are of medium size. They should always be almond shaped. A distinguishing trait of most Shiloh Shepherds is a circle of lighter colored fur around eyes. A white blaze on the chest and white markings on the toes are acceptable and common as well. The breed standard recognizes 35 different color combinations.